In just one hour, the sun produces enough energy to power the world for an entire year yet solar energy makes up less than 1% of our global energy production. How can we leapfrog incremental progress to convert the planet to 100% clean energy in our lifetime? You can clearly see the opportunity here. The answer is to make solar technology capture the world’s imagination. Like Tesla and Apple before us, we use Shala.’s art and design genius to elegantly marry form and function. By freeing solar technology from its traditional form, we at The Movement Worldwide envision a world where art, creativity and solar energy is ubiquitous. Solar technology is on every surface of every building, ushering in the inevitable era of 100% clean energy. Get in touch with us today. Email or request a quote to reach your consultant; who will pre-qualify your home, brand or business, answer your questions and ensure a smooth process. Your adviser will share a proposal that includes a rendering of your home with customized solar panels, system details and information on pricing, financing and estimated savings. If you like what you see, we then ask you for a $1500 fully refundable deposit to lock in your savings and reserve your system. We file all necessary paperwork and permits on your behalf, professionally install your system, and connect you to the grid. Your installation will eventually pay for itself! You are all set. Brag, save and inspire others. Thank you for moving the world forward. When it comes to your home or business, the beauty is in the details. 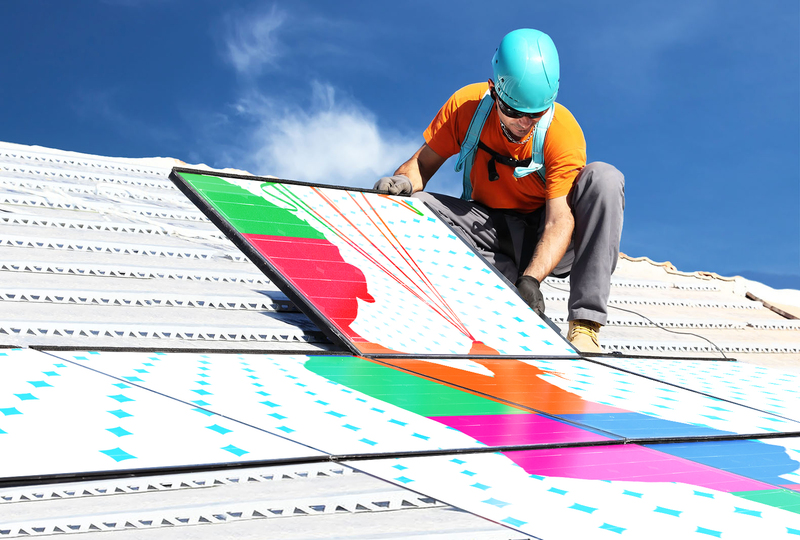 Why should your solar panels be any different? We use exclusive state of the art technology to bring sustainability, savings, originality and culture to your home or business. Using patent pending technology, Shala. and his team of designers create custom solar panels to blend in with your roof, wall, or any other surface elegantly generating clean energy to run your home or power your business, saving you money every month, all without compromising aesthetics. As we mentioned, our designers can also personalize your property with murals and images as unique as your home. For those who want to go with a more subtle approach, there are textile options to blend seamlessly with the roof of your home. If you can personalize your home, down to the smallest details, should you not be able to customize your solar energy system's look also? It is really simple. Shala's Bronzeville Solar Pyramid, shown above, is a free-standing landmark public installation commissioned by ComEd and the City of Chicago. It was erected on August 21, 2017. It generates ~2000 watts of solar energy and illuminates at night. It will power the neighboring Gallery Guichard. If you are an agency or brand manager and you see a tremendous opportunity in partnering with us, please contact us with business inquires here . Shala. is interested in working with companies and organizations that align with our mission of promoting art, social responsibility and fresh innovative projects. 9 out of 10 homeowners agree - when it comes to their home, aesthetics matter. That's why we created SolarSkin - the only solar panels that are designed to seamlessly complement your roof. Research from the Lawrence Berkeley National Lab shows that on average, a house with a 3KW solar system commands a $17,000 higher selling price than a comparable house without one. That premium alone more than repays the initial cost of the system. And, with SolarSkin panels, you’ll even make your neighbors smile. We will design your system, install the panels and ensure monthly savings. Your current utility won't tell you this, but it’s actually cheaper today to generate your own clean, renewable electricity with solar panels than to buy it from your current provider, who is burning dirty coal.